Arthur Beattie was born in Long Preston and has always had his home in the village. He attended school at Long Preston and then at Skipton. Arthur worked as a chartered accountant in Settle and then at Silentnight in Barnoldswick. 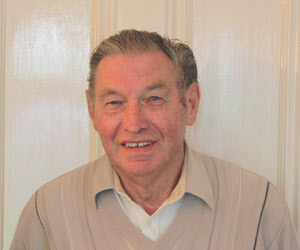 Part A: Arthur talks about living in Long Preston as a schoolboy, playing cricket & football on the village green. Helping with hen keeping and egg hatching. Then working in Settle. Memories of a German bomber over the village, three bombs being dropped and of his National Service. He later worked for Silentnight, the bed manufacturers, as an accountant and progressed to be Managing Director . Arthur recounts Entertainment in the village and going to the cinema in Settle. Part B: Discusses the shops, banks and auction mart in the village, and how it was kept clean & tidy by a lengthsman. Travelling by train and nights out in Morecambe. Tells of the various celebrations held in the village, and how on Sundays always attended Chapel. Part C: About serving on the Long Preston Water Trust.